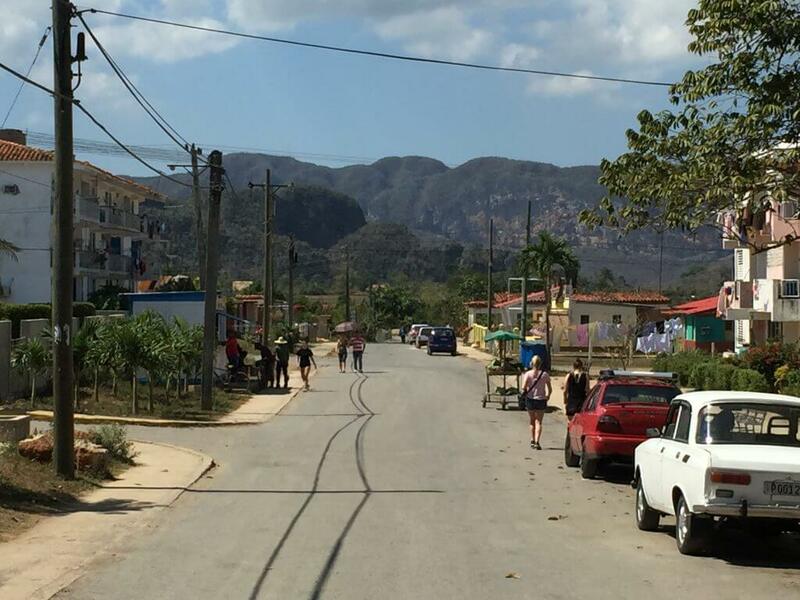 Viñales is about 2-and-a-half hours southwest from Havana. 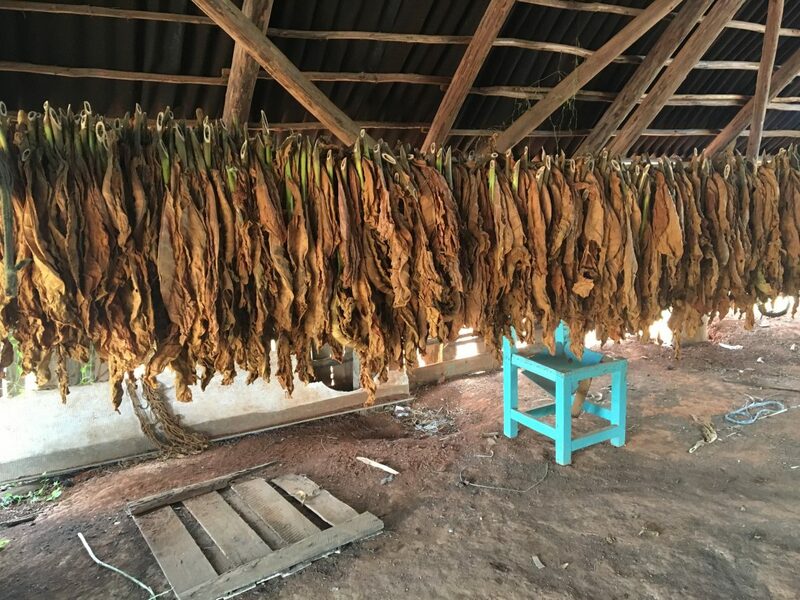 It’s in the countryside and known for tobacco, coffee, and honey production. 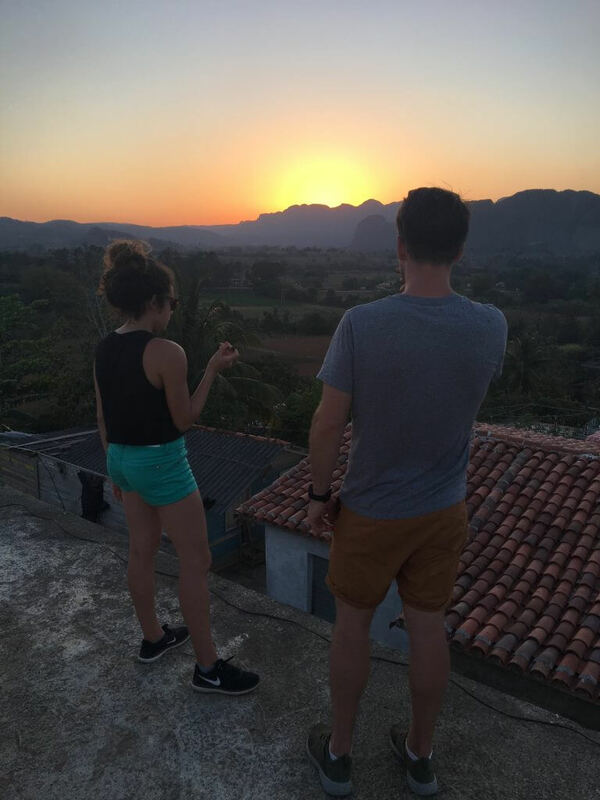 Although it is a bit touristy, we still had a wonderful time and highly recommend making the trip to Viñales while you’re traveling in Cuba. Plus, Viñales is the place to get cigars while you’re traveling in Cuba. To get to Viñales from Havana, we took a shared taxi. Wherever you stay, your host can most likely help you order one of these to your next destination whether it is a different city or the airport. In our opinion, this was a better option than taking a bus because it was a shorter ride, and it is door to door service, meaning the taxi picks you up and drops you off right where you’re staying. There is no need to reserve a shared taxi before your trip, wherever you are staying can arrange it for you. Here’s are guide to How to Go to Cuba as an American that covers everything from visas to money and transportation. 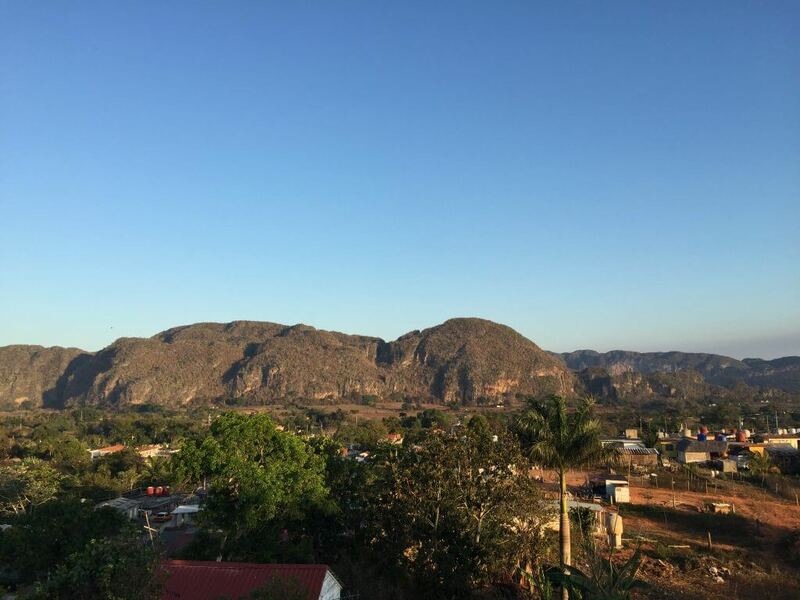 If you have enough time in Cuba, we definitely recommend taking a break from the city in Havana and exploring what Viñales has to offer. Viñales is covered in casas particulares. These are houses like Airbnbs, but you do not always need a reservation ahead of time to stay there. Most of them have a sign on the front saying if they are occupied or not. We, however, used Airbnb once again because we thought it would be one less thing to worry about once there. 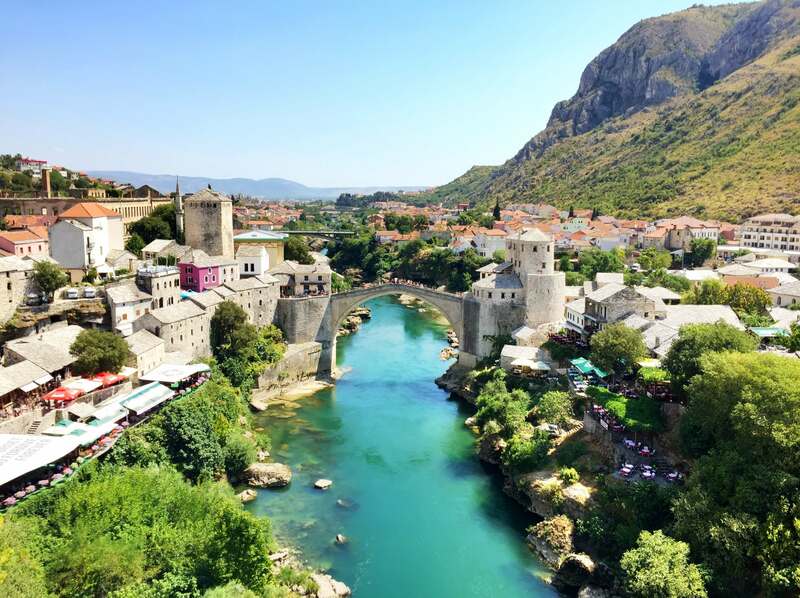 Explore the city center – Although the city of Viñales is not that big, the city itself has a lot to offer. Calle Salvador Cisneros, the main street, runs through the city and is filled with restaurants, shops, and bars along with the side streets around it. There is a plaza where you can access WiFi and a street market with souvenirs to buy. In the market, there will be people who are offering various tours throughout Viñales. Everyone will have their own price, and you might want to haggle a bit with them. It is up to you whether or not you want to sign up for one with them. Otherwise, you can also book tours through your Airbnb/casa particular host or in advance. 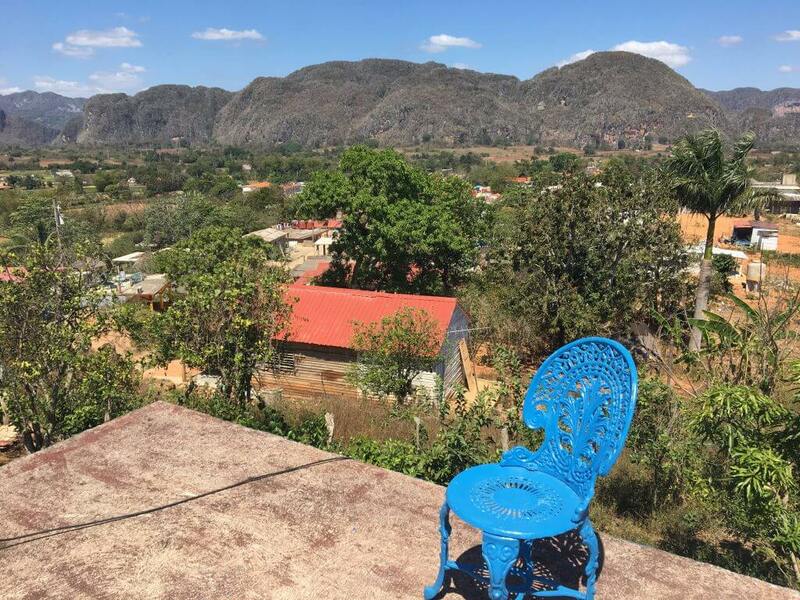 The two other main things that we did while in Viñales were booked through Airbnb Experiences. 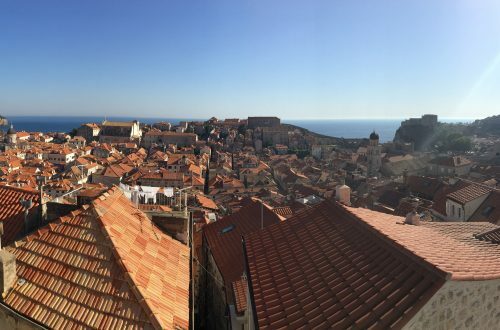 If you’ve never looked through Airbnb Experiences, we highly recommend doing so. 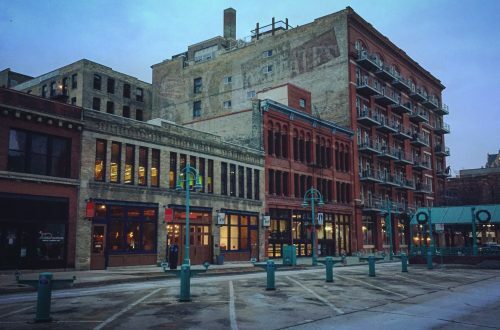 There are lots of things offered, including tours, classes, workshops, bar crawls, and excursions. 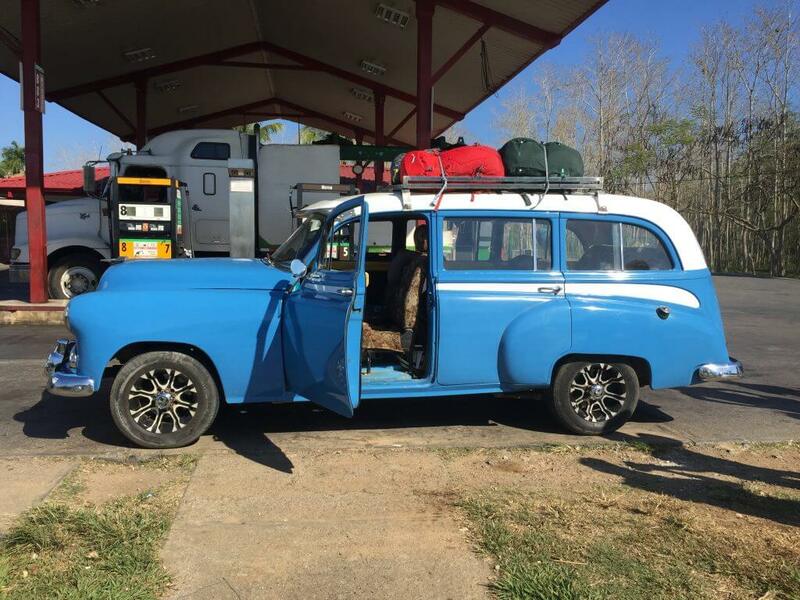 If you go to Cuba under the visa category “Support for the Cuban People,” Airbnb Experiences are a great thing to check out because they will help you meet your visa requirement of interacting with the locals. It will also save you from some stress trying to book things last minute. 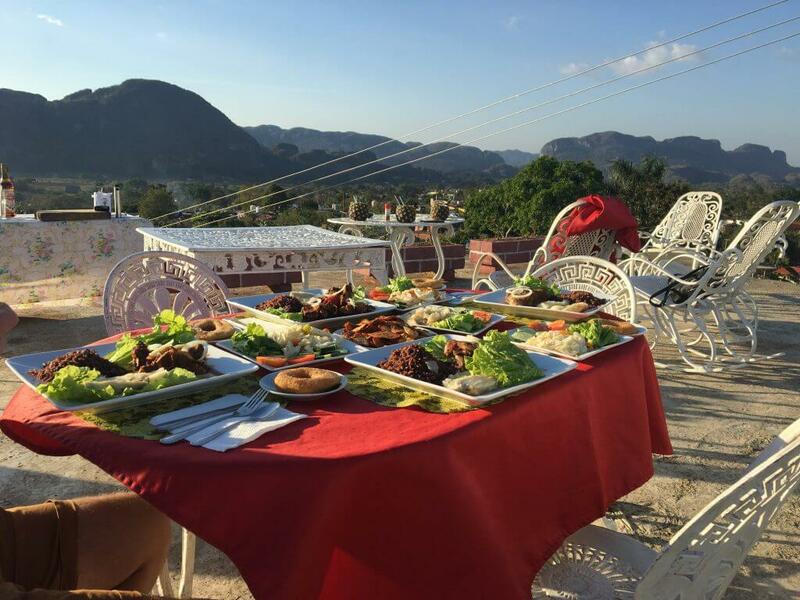 Cocktails and Sunset – Our first airbnb experience in Viñales was having dinner at the house of a local. The host, Yordanis was excellent. He first taught us how to make authentic Piña Coladas. Him and his wife then cooked us an authentic Cuban meal including our choice of fish or meat, yuca, salad, rice and beans, plantains, vegetables, and dessert. This was followed by a post-dinner Cuban cigar. We were able to enjoy do all of this while enjoying a spectacular sunset from his rooftop. We were also able to ask Yordanis and his family about their life in Viñales and what he enjoyed most about meeting tourists. If we had to pick something to do in Viñales, this would be it. Click here to schedule your own cocktails and sunset experience. 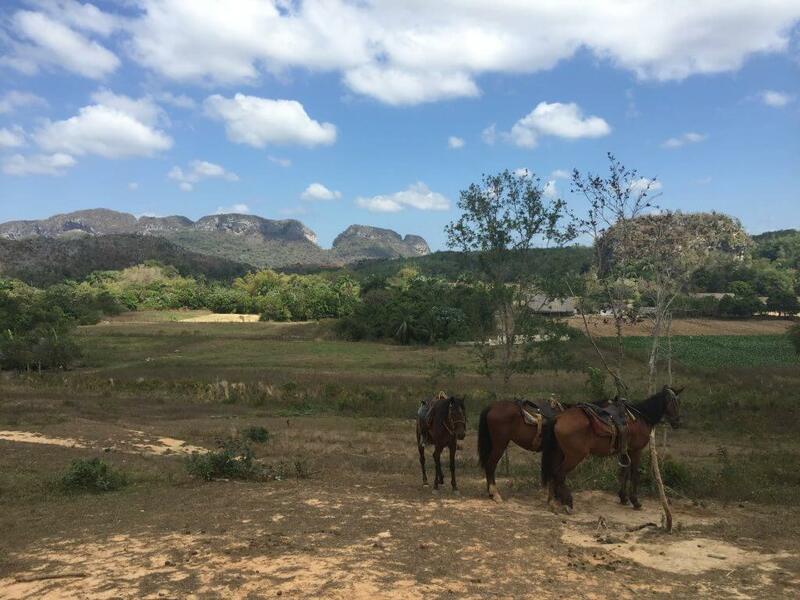 Horses through countryside – As said before, Viñales is known for their tobacco, and it is definitely the place to go if you are trying to bring back some cigars because you’ll get them straight from the source. There are many ways to sign up for a tour through the plantations including asking your casa particular/ Airbnb host, planning an Airbnb excursion, or just walking through town and having locals ask you. It sounded like they all more or less offered about the same thing. We planned ours ahead of time again using airbnb experiences. In total, it included a tour by horseback, a guide, different samplings at each of the plantations, coffee, honey and tobacco, a tour of each of the plantations, and a Cuban lunch. This was a great way to see Viñales and enjoy the countryside. Click here to see the tour that we took and sign up for your own. Besides the food that we enjoyed on both Airbnb Experiences, there were a few restaurants in town we were able to eat at. La Esquinita – The first restaurant we ate at was called La Esquinita. It is just by the main street in town. To be honest, this was one of the first places we came across because we were very hungry after our shared taxi ride. However, the food was great! 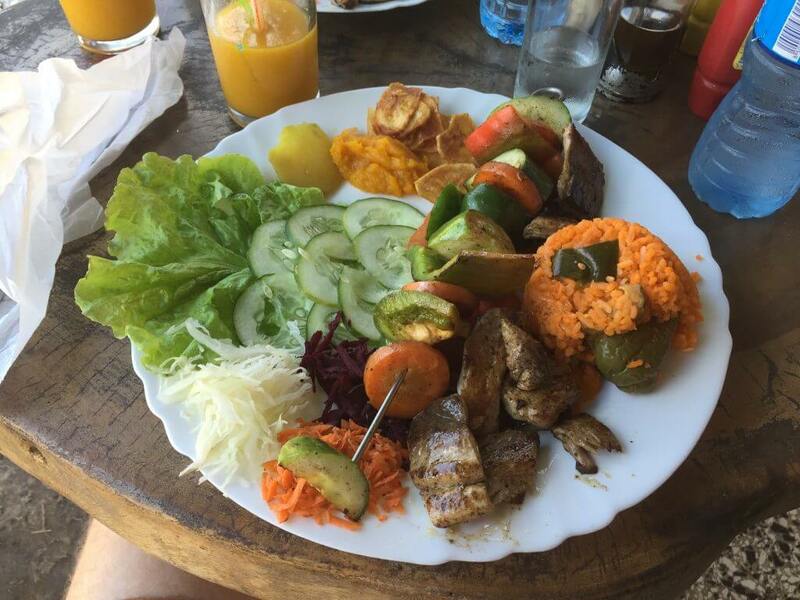 They offered a variety of Cuban food. We recommend the croquettas! La colonial – This restaurant was also on the main road, and they were known for having Italian food. We stopped here to have some food before getting some drinks later on. Lounge Bar – There are many places in Vinales that have live music playing. This was one of the places we checked out. The staff was very friendly, they had a fun band playing (we bought their CD), and the cocktails were great. There is a cute outdoor patio in back just make sure to wear bug spray! 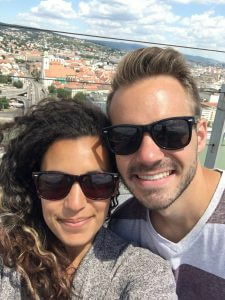 If you want to travel to Cuba, check out our other posts on the 10 Do’s and Don’ts of Traveling to Cuba, How to Go to Cuba as an American, and One Week Itinerary for Cuba. Do you have any recommendations for Viñales? What’s your favorite thing to do there?